What is advantage of pre compression? 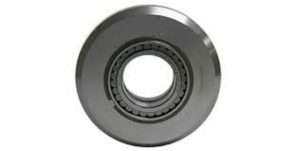 Overload assembly or hydraulic assembly acts as a cushion to pressure rollers. Sometimes, Upper punch penetration is also used to control capping as we know if compression is occurring too deep in die it will lead to capping due to inability of air to escape from die in that case upper punch penetration can be changed by altering the position of upper-pressure roller slightly upward 1.5 to 3.0 mm of punch penetration is best for pharmaceutical products . However to control the capping problem due to compression occurring too deep in die nowadays tapered dies are used. Some fines are exposed to the air if vacuum pickup is not working properly and fines get deposited on pressure rollers adhering to lubrication on rollers causing deterioration of rollers.